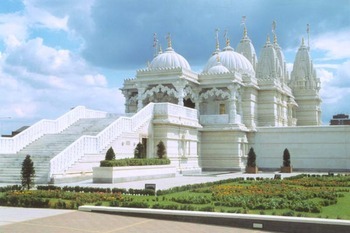 I was back in London again this past weekend (this time for Saturday's peace march), and on our way out of the city on Sunday we stopped by one of London's most beautiful, unusual, and myth-filled sites: the Shri Swaminarayan Mandir, the largest traditional Hindu temple outside of India. 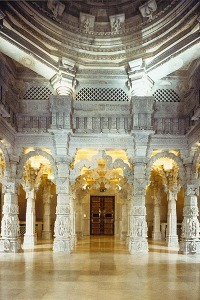 The mandir rises like a white dream palace above the unprepossessing streets of London's Neasden neighborhood, built of 5,000 tons of Italian marble and Bulgarian limestone, hand-carved into 26,300 pieces by 1,526 skilled craftsmen. The walls, pillars, ceilings and floors of the temple are enriched by carvings, tiles, paintings and rugs depicting the mythology and sacred beliefs of a people whose faith dates back over 8,500 years. Stepping through the mandir's doors is like stepping into a place that exists outside of time, where ancient stories and modern life come seamlessly together. The city streets seem a million miles away as one sits barefoot, deep in the silence, on the carpet beneath the temple's great dome, surrounded by men, women, and children deep in meditation and prayer. 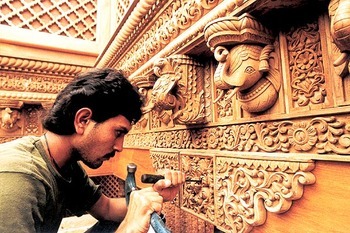 "From conception to completion," the temple's website explains, "the Hindu ethos for building a mandir requires that nature is appeased through various rites performed during the different stages of mandir construction. The ritual of Khatmuhurt involves the paying of homage to the land and using prayers to seek permission of the earth to disturb its natural state for construction. For the ritual of Shilanyas, the foundations are dug and below the garbhagruha a small pot containing sacraments is ceremonially placed. This creates an awareness that nature is a dynamic ecosystem and man is to live harmoniously with other life forms. 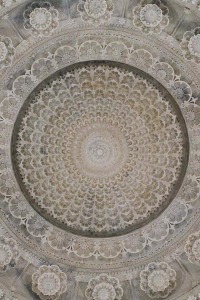 "The Hindu mathematician sees within the design a complex pattern of mathematics and geometrics that link the mandir to the universe and its component stars, planets and galaxies. Underneath the intricate artistic sculpture lies a foundation of regular shapes. The birth of geometry and numeracy arose from the need to build mandirs of perfect proportions. 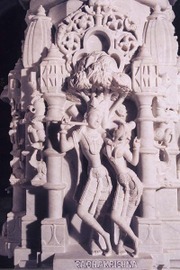 Traditionally, all the masonry of such a mandir is loadbearing in itself, with no reinforcement from ferrous metals such as steel in its foundation or structure. The cantilevered dome is believed to be the only one in Britain that does not use steel or lead, for ferrous metals concentrate the earth's magnetic field, which would impede meditation." In addition to the prayer hall and cultural center, the mandir contains an extensive exhibition on the history of Hinduism, introducing visitors to one of the world's most ancient cosmologies, full of wonderful stories of gods and goddesses, of spiritual leaders and ascetics, and of captivating heroes such as Hanuman (the monkey deity) and Ganesh (the jolly elephant-headed god, remover of obstacles). "Mandir is a Sanskrit word for where the mind becomes still and the soul floats freely to seek the source of life, peace, joy, and comfort," the temple guide explains. "For centuries, mandirs have been a center of life for the Indian people -- a common community place where people forget their differences and voluntarily unite to serve society." 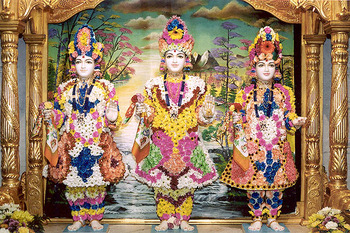 To learn more about the mandir in London (including a calendar of temple festivals and events), visit the Shri Swaminarayan Mandir website. 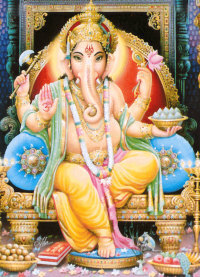 For more information on the Hindu faith and its traditional stories, visit the Hinduism Today, Hinduism. and Sanatan Society websites. 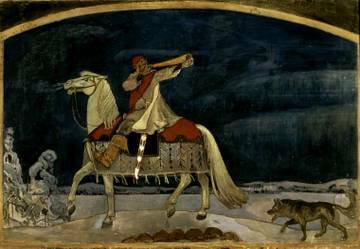 The Groninger Museum in the Netherlands has opened an exhibition titled Akseli Gallen-Kallela: The Spirit of Finland, featuring the work of an artist best known for his paintings illustrating Finland's great myth cycle, The Kalevala. The show runs from December 17 to April 15, 2007. 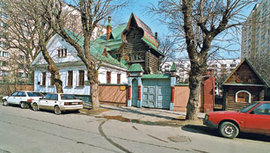 More information can be found on the museum's website, and the show's catalog can be obtained here. Akseli Gallen-Kallela was born in Pori in 1865, educated in Helsinki, and moved to Paris in 1884 to study art at the Academie Julian. Like many of his contemporaries, he painted bohemian scenes of the Paris art world and cafe life -- until he began to divide his time between Paris and rural Finland, where he lived in remote villages and depicted the people and customs of the countryside. 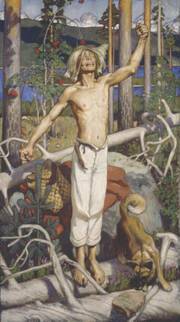 He married his wife Mary in 1890, and they traveled together to eastern Finland and northern Karelia, where he began to gather material for his Kalevala paintings in the very landscapes where the ancient stories were set. 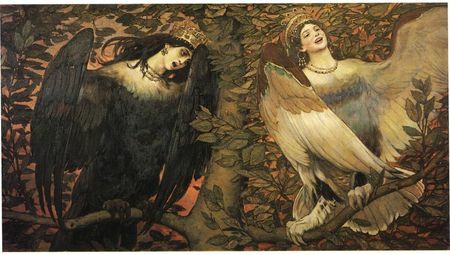 Like his friend the composer Jean Sibelius, Askeli became deeply obsessed by these magical tales, using their themes to express an ideal of "Finnishness" at a time when Finland was still part of the Russian Empire. 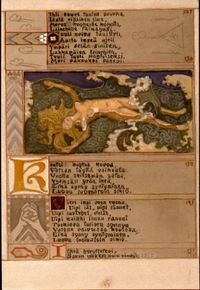 Askeli went on to become one of the best-loved artists in Finland's history, turning his hand to book design, interior design, textiles, stained glass, metal-work and many other forms of art in addition to painting. In 1911, he fulfilled a life-long dream by building a home and studio in the woods of Tarvaspaa, creating a crenelated castle which has since been turned into The Gallen-Kallela Museum. By the 1920s, however, the painter saw his fame begin to diminish as a younger generation of modernist artists dismissed his work as old-fashioned. 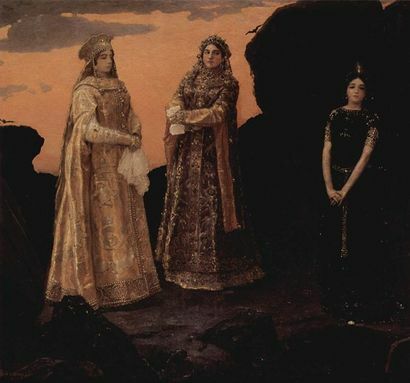 Askeli moved his family to America and settled in Taos, New Mexico, where he painted scenes of Western and Native American life in addition to continuing to illustrate his beloved Kalevala. 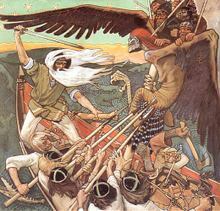 More information on the Kalevala epic can be found on the Virtual Finland site, on the Sacred Texts site, and in Ari Berk's article on "The Song of the Sampo" in the Endicott archives. 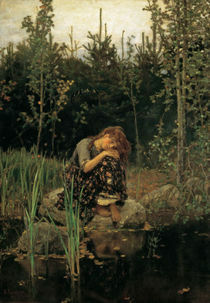 You'll also find it on A Europe of Tales, a web project sponsored by the Gallen-Kallela Museum. The intention of the project is to use multi-media technology to present European myths and legends aimed at an audience of children aged ten to fifteen. The stories are produced in eight languages: Finnish, Swedish, English, Gaelic, French, Breton, Icelandic and Italian. I recommend The Lemminkäinen Suite, symphonic music based on four legends from the Kalevala by Jean Sibelius, and Kalevala: Dream of the Salmon Maiden, a CD of music and song (in Finnish and English) by Ruth Mackenzie. 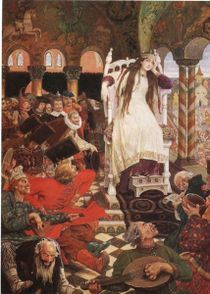 You can also listen to "Kalevala" and "Out of Finland," two excellent programs from Ellen Kushner's Sound & Spirit radio series, by going here.